Guaranteed to thrill, the dual-line Synapse series is all about speed and agility. 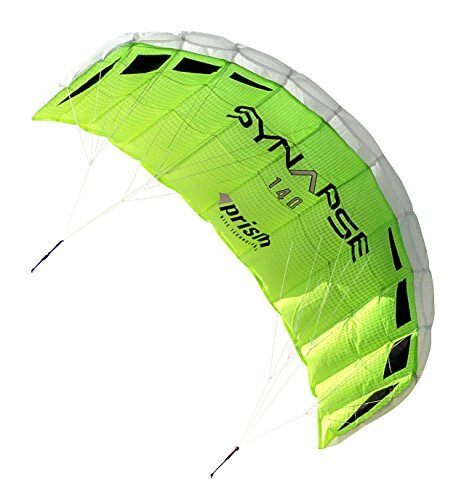 Perfect for beginners, the Synapse comes ready to fly and stuffs into a compact pouch to take with you anywhere. Their high-aspect ratio wings steer with sports car precision, while remaining stable and forgiving enough for new pilots to master dual-line control. An all fabric design means no frame parts to damage and no assembly required. Choose from three sizes - the bigger you go, the more you’ll feel the power of the wind. Beautifully crafted by the kite experts at Prism Designs. 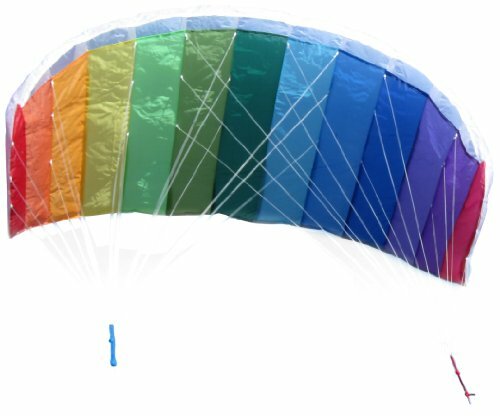 With 25 years in flight, we’re committed to sharing the joy of kites with exquisitely designed, long-lasting products and all the info and support you need to have a blast in the wind. In the Breeze has been manufacturing outdoor fabric decorative products, kinetic spinners and kites for 30 years. We are an award winning leader in manufacturing offering our customers innovative designs and products. All of our products use the latest techniques. Our product development team pays attention to every detail including the best fabric compositions, color trends, printing techniques, sewing and embroidery applications. In addition we are using innovative connectors, fiberglass, string, swivels, adherents and findings.In the Breeze believes that color processing and motion stimuli are essential to both adults and especially children who have developing brains. Color our world with color in motion! In the Breeze has been manufacturing outdoor fabric decorative products, kinetic spinners and kites for 30 years. We are an award winning leader in manufacturing offering our customers innovative designs and products. All of our products use the latest techniques. Our product development team pays attention to every detail including the best fabric compositions, color trends, printing techniques, sewing and embroidery applications. In addition we are using innovative connectors, fiberglass, string, swivels, adherents and findings. 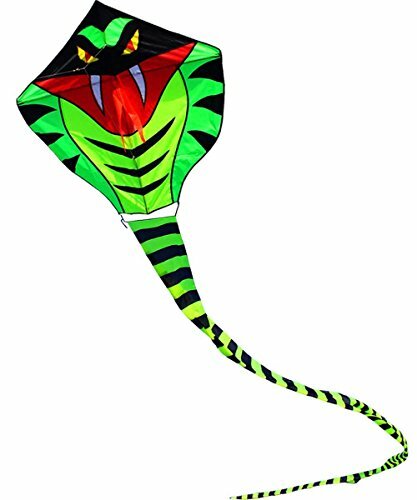 In The Breeze Kites are extremely easy to assemble and fly. They have been flight tested in varied conditions. A reusable kite bag, kite line and winder are included. 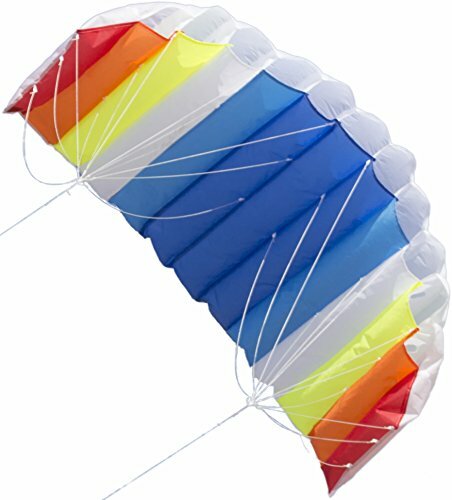 This kite will provide hours of enjoyment and lasting memories for kids, children, young minded adults and active seniors. Kite flying encourages outdoor play. Get out of the house and go fly a kite. It will combat stress, relieve boredom, get you to exercise, breath in fresh air and have fun. In the Breeze believes that color processing and motion stimuli are essential to both adults and especially children who have developing brains. Ready to fly with a dual-line control bar, Tantrum parafoils are speedy, ruggedly built, and a blast to fly - you’ll be digging your heels in as the breeze picks up! Perfect trainers for traction kiting, kiteboarding, or all-around fun, they’ll teach you solid kite handling skills before you take on the serious pull of a full-sized water or traction kite. 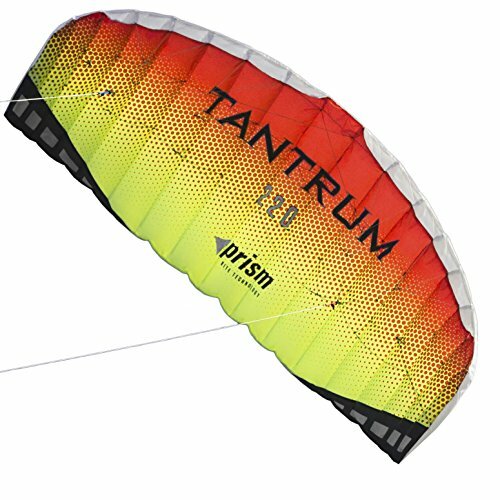 In stronger winds, the Tantrum’s high aspect, low-drag airfoil delivers impressive speed and more than enough power to drag you down the beach with an adrenaline-stoked grin. Use the included safety leash in case things get too wild - just let go of the bar and the kite will settle safely to the ground while tethered to your wrist. Choose the 220 for stronger winds and quicker turns, or the 250 for heavier pilots and lighter winds. Beautifully crafted by the kite experts at Prism Designs. With 25 years in flight, we’re committed to sharing the joy of kites with exquisitely designed, long-lasting products and all the info and support you need to have a blast in the wind. 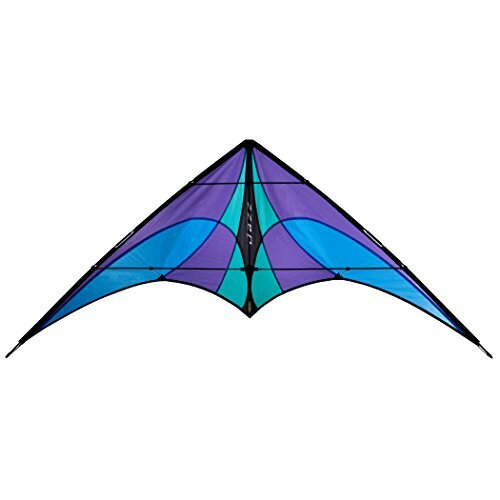 Airfoil Stunt Kite by Moon Glow Sports Dual-Line Kite Flying is great fun for beginners or advanced kite enthusiasts. Great Excitement as your Airfoil Kite lifts off for the first time and Soars into the Sky. 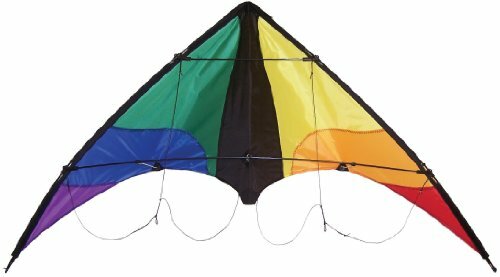 • Large 62" wide Rainbow Color Airfoil Kite • Constructed of Sturdy Weather Resistant Rip-Stop Fabric • No Frame to Assemble • Handy Winder for easy string storage No Worries. Everything is Included! • Kite, 2 Strong Braided Control Strings, 2 Handles and Winder. • Just add wind, 6-25mph, and you're ready to soar. Free Instructional Assembly eBook • No Assembly Required other than tying 2 strings on the kite. Free Kite Flying Tips eBook After your day of fun is over, your kite can be easily packed and stored in the carry bag for safe keeping. Guarantee 30 days, no questions asked, money back guarantee if unsatisfied with the product. 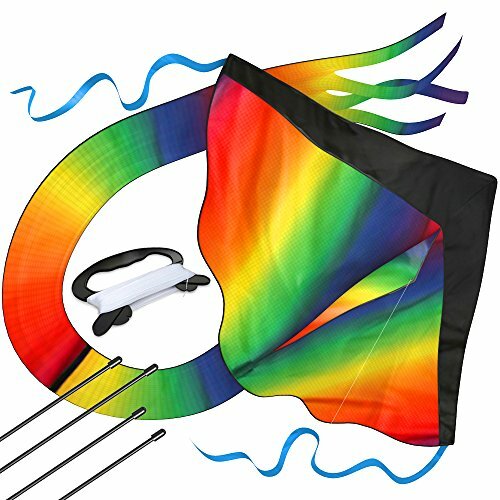 Click the Add to Cart Button at the Top of this Page to Start a New Adventure in Kite Flying! 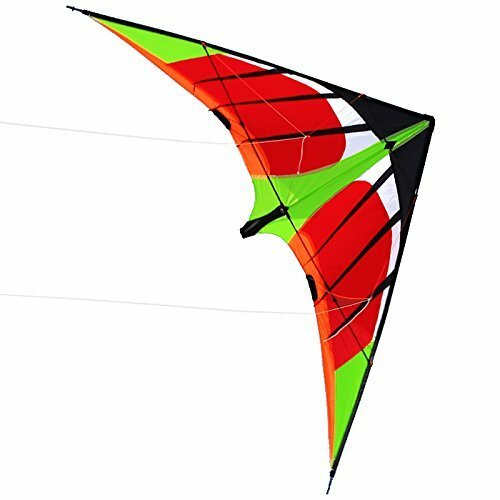 The Symphony Beach III 1.3 Stunt Foil Kite features bright, eye catching colors and an impressive 51 Inch width and 22 inch height to delight spectators visually with it's performance, size and beauty. Created with Rip Stop Polyester for ultimate durability, Line is included with winder and straps. 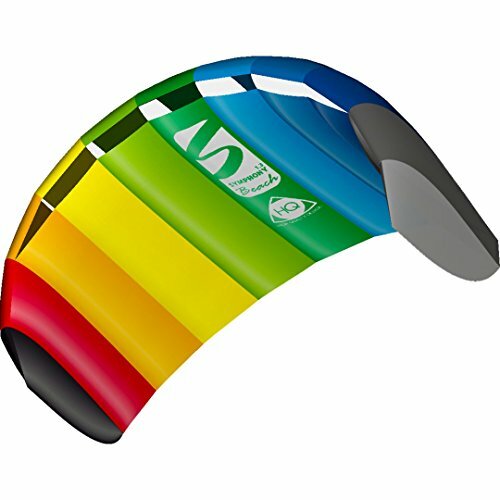 Whether you are teaching your children to fly kites for the first time, or want a more sporty kite for advanced tricks and stunts, HQ can provide you with everything you need. Let our expertise get you up in the air! We have an international background using a worldwide network of designers and engineers to ensure the highest level of innovation and quality.